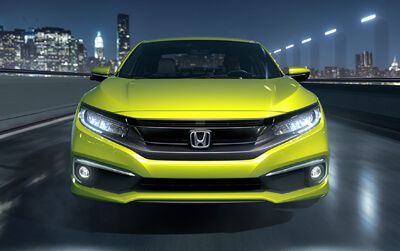 The Civic Touring Coupe features LED headlights with auto-on/off that light up the road and create a unique, noticeable light signature. The EX and EX-L trims strike an elegant stance with their all-new 17-inch alloy wheels. 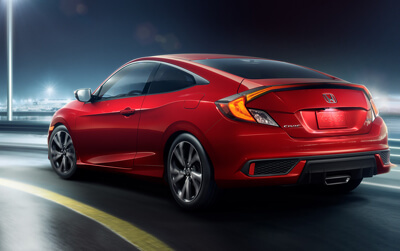 The Civic Coupe features a wide, aggressive stance that’s ready to scorch the pavement. Just push the pedal. 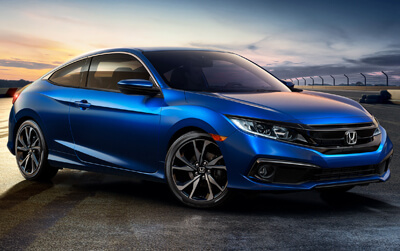 The new Civic Sport Coupe makes a splash with 18-inch alloy wheels and a center-mounted exhaust. The perfect way to add extra wow factor to your new Civic. Alloy wheels can help ensure the longevity of wheel bearings and suspension joints. 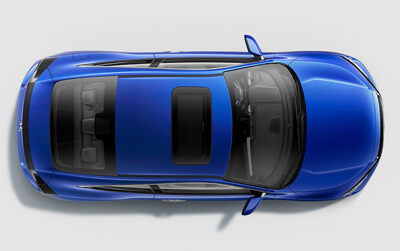 The Front Underbody Spoiler accentuates the aggressive and sporty character of the Civic while optimizing the ground effects. Choose it for its sleek look and you get a surprising bonus. The moonroof visor adds to a more comfortable and enjoyable driving experience. Splash guards are a nice finishing touch. They give your Civic a great look and help protect your paint from chips and scratches. 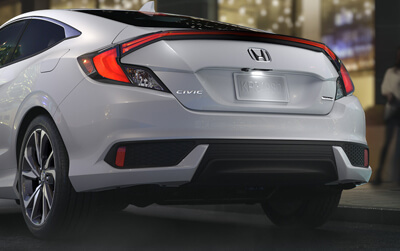 Give your new Civic an aerodynamic exclamation point with a wing spoiler that adds a customized look. Body side molding accentuates the Civic’s styling. It’s ideally positioned to help protect against door dings and scratches. 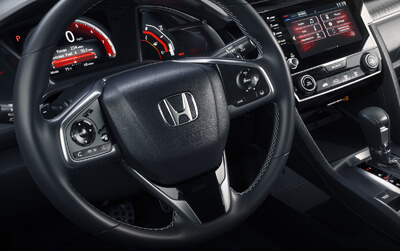 Get a comfortable grip and take control of the Civic Coupe with the stylish leather-wrapped steering wheel and shift knob. Leather-wrapped steering wheel and shift knob standard on Sport and above. Heated seats for the driver and front passenger are standard on EX and Touring. That’s pretty hot. The ergonomic instrument panel features a single-level display that’s easy to read, so you can spend more time watching the scenery fly by. Engaging a parking brake has never been easier. The Civic Coupe features an electric parking brake that quickly and simply activates with the lift of a finger. Beneath the Civic Coupe center console’s sliding armrest, you’ll find a sliding dual beverage holder, sliding small-item tray and enough room to hold a tablet. 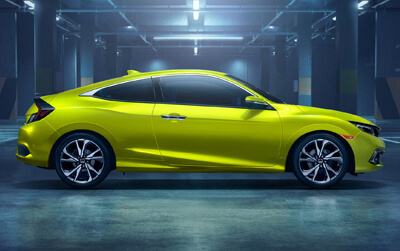 The new Sport trim on the Civic Coupe adds to its performance-driven styling with racing-inspired sport pedals. Sport pedals standard on Sport and Touring. 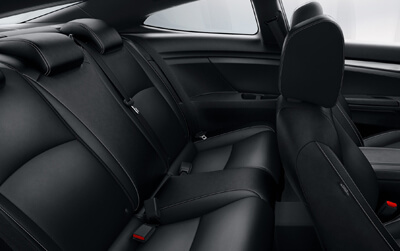 Plush leather-trimmed seats offer a stylish look to the 2019 Civic Touring Coupe and a supportive, sporty feel to every drive. Commencing launch sequence in 3… 2… 1… Blast off in the confidence-inspiring cockpit of the Civic Coupe. 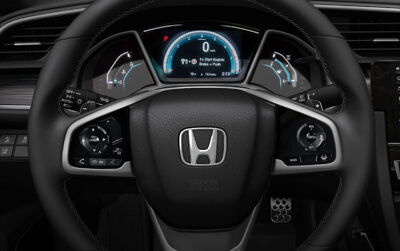 The interior of the Civic Coupe was designed to put everything intuitively within reach, from the controls to the Display Audio touch-screen to the storage console. Civic Coupe has seating for five and all the interior space you’ll need to pile in with your friends and turn a Sunday drive into something bigger. With generous trunk space and a 60/40 split fold-down rear seatback, you have plenty of room to pack it all in and head on out. The extended sidewalls of the all-season floor mats add extra protection to shield your original carpets from the wear and tear of everyday driving. The Armrest with Illumination adds comfort to both driver and passenger. Bring to light the refined details of your Civic’s interior with the soft glow of console illumination. The Carpet Trunk Mat gives your trunk area a finished look while adding an important extra layer of protection. 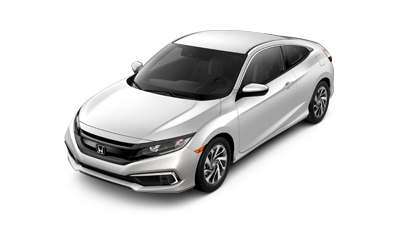 With available features like a 450-watt, 10-speaker premium audio system and Apple CarPlay™ and Android Auto™ integration, the Civic Coupe keeps you well connected. Apple CarPlay™ and Android Auto™ integration standard on Sport and above. 450-watt premium audio system standard on EX and Touring. 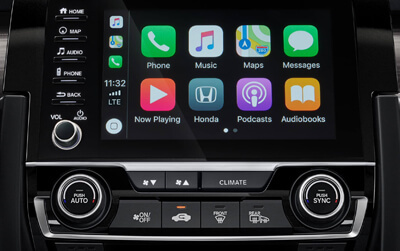 Apple CarPlay™ integration is the best way to tap into your iPhone® in the Civic Coupe, using the built-in Display Audio touch-screen to access music, messages and more. Apple CarPlay™ integration standard on Sport and above. 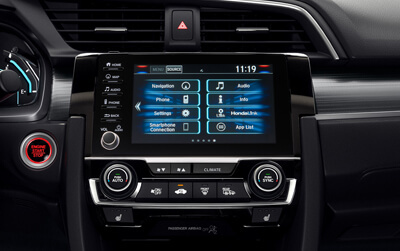 Android Auto™ integration allows for seamless access to directions, text messages and your music library through the built-in Display Audio touch-screen. Juke traffic while jamming out to your favorite tunes with SiriusXM® Radio and HD Radio™. SiriusXM® Radio and HD Radio™ available on EX and Touring. HondaLink® standard on Sport and above. Whatever soundtrack you cue up for the drive, the available premium audio system will kick out the jams with 10 speakers and 450 watts of power. 450-watt premium audio system standard on EX and Touring. The 2019 Honda Civic Coupe is packed with cutting-edge technology offerings and is perfectly primed to lead the charge for the next generation. Find the best route, hands-free, with the Honda Satellite-Linked Navigation System™ with voice recognition and Honda HD Digital Traffic. Honda LaneWatch™ standard on EX and Touring. With the available Smart Entry key, you can start your Civic Coupe remotely, and lock and unlock it without taking your keys out of your pocket. Smart Entry with Walk Away Auto Lock® standard on Sport and above. With up to 174 horsepower, a fully independent suspension and more, the Civic Coupe was designed for lively, invigorating performance. 174 horsepower standard on EX and Touring. 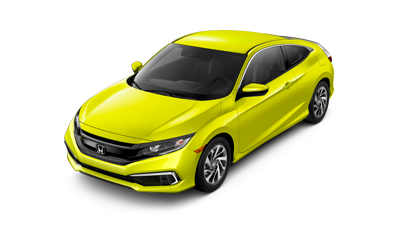 Civic offers a turbocharged engine that produces 174 horsepower and turns every green light into an opportunity for exhilaration. 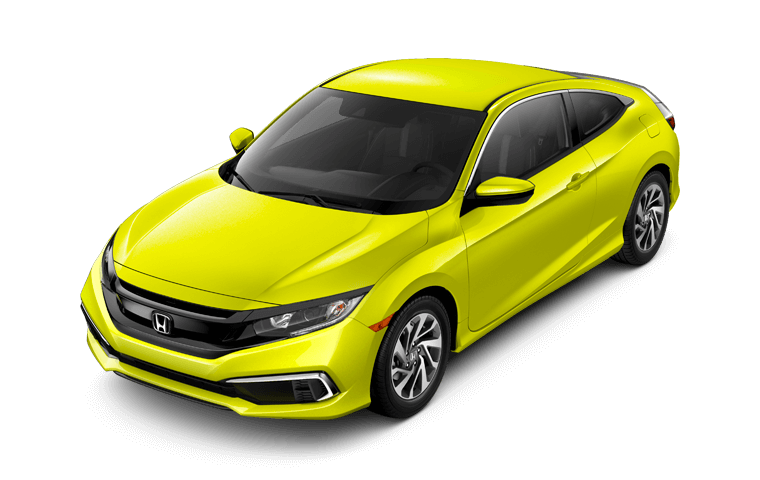 Civic Coupe offers a standard 158 horsepower, 2.0-liter naturally aspirated engine that helped it receive an EPA 39-mpg highway rating, proving normal is anything but boring. 158 horsepower standard on LX and Sport. 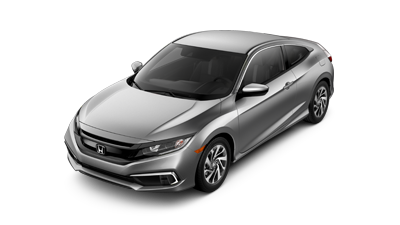 The Civic Coupe was designed to handle with the best of them, featuring standard MacPherson struts and a lightweight, rigid body structure. Civic Sport Coupe shown in Rallye Red. 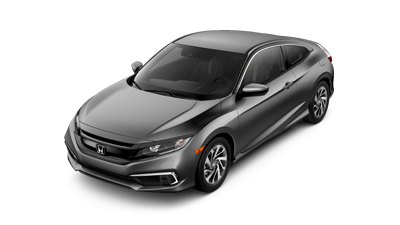 Becoming one with the Civic Sport Coupe is easy once you grab the stick shift and make your way through its snappy, 6-speed manual transmission. The continuously variable transmissions (CVT) offered for the Civic Coupe were optimized for plenty of power without sacrificing fuel efficiency. This suite of safety and driver-assistive technologies—now standard on every Civic Coupe—is designed to alert you to things you might miss while driving. Adaptive Cruise Control (ACC) with Low-Speed Follow helps you maintain a set following interval behind detected vehicles for highway driving. If the detected vehicle slows to a stop, ACC is designed to slow and stop your vehicle as well. After stopping, a tap on the throttle instructs the car to continue maintaining the desired interval. 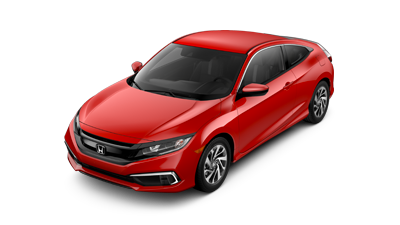 The 2019 Honda Civic Coupe delivers the sporty look, performance, and comfort that drivers have come to expect from this dynamic two-door. Clean lines paired with the latest technology and responsive handling of a true Honda icon add up to a driving experience you’re not likely to forget. Whether you prefer the smooth-shifting 6-speed manual or the hyper-efficient CVT, the Civic Coupe makes impressive fuel economy. The powertrain brings more choices, including a spirited 158-hp inline-4 or available 174-hp turbocharged engine—both capable of nailing hairpin turns and keeping your body pressed to the seat. The Civic doesn’t sacrifice comfort for speed, however, and nowhere is this more apparent than inside the sporty coupe. There’s something special about a truly intuitive ride, with everything in its place. A premium feel from available features like heated front seats and a 7-inch Display Audio touch-screen complete the experience. No matter if you’re heading out for a few minutes or a few hundred miles, you’ll be comfortable and connected the whole way behind the wheel of a 2019 Civic Coupe.